Preheat the oven to gas mark 180°C, and butter and line a 9 inch springform tin. Pour the Guinness into a large wide saucepan, add the butter and heat until melted, at which point you should whisk in the cocoa and sugar. Beat the yoghurt with the eggs and vanilla and then pour into the saucepan and whisk in the flour and bicarb. Pour the cake batter into the greased and lined tin and bake for 45 minutes. Leave to cool completely in the tin on a cooling rack. Once the cake has cooled completely, sit it on a flat platter in preparation for icing. Lightly whip the yoghurt and double cream until smooth, sieve over the icing sugar and cornflour and then beat to combine. 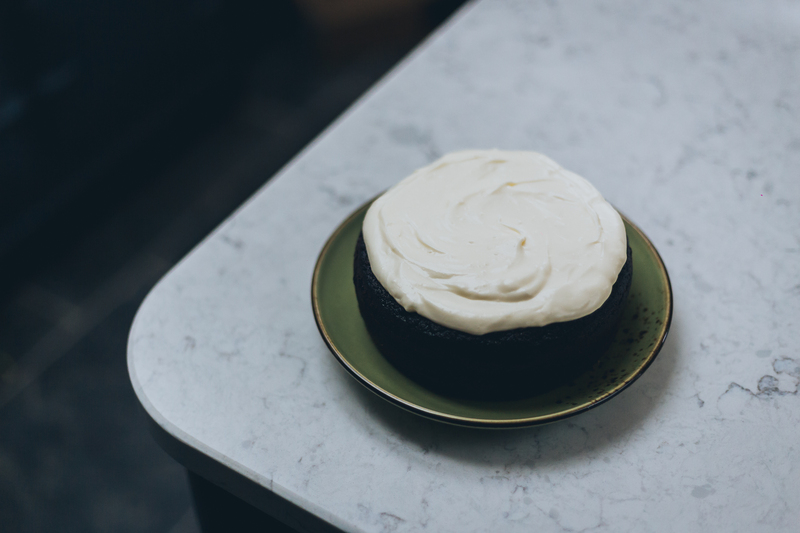 Ice the top of the black cake so that it resembles the frothy top of the iconic pint.